Guatemalan Sawdust Carpet — Community Event — During the week preceding Easter people throughout Guatemala prepare buckets of colored sawdust, sweep the streets and gather to design a layout for sawdust carpets that will fill an entire street. The sawdust carpets can stretch as long as several blocks brightly picturing Easter scenes. The education department at El Museo del Barrio adapted the concept to celebrate Museum Mile Night in June, an event when Fifth Avenue is closed from East 82 Street to East 105 Street so that the museums along “The Mile” can welcome viewers inside and outside their museums. After months of collecting and preparing colored sawdust the educators had an artist draw a map of the Americas on the black asphalt of Fifth Avenue. 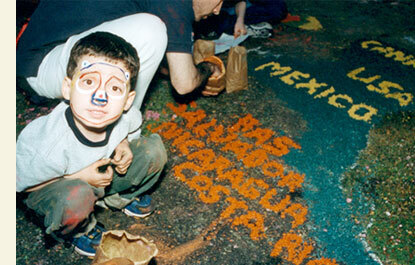 The community was invited to fill in the map using the prepared stencils and sawdust supplies. The sawdust carpet occupied almost the entire street for one city block, with a huge map of Canada, United States, Mexico, Central America and South America. Over 500 neighbors from East Harlem joined the museum educators and artists to help to sift the colored sawdust and trace the Guatemalan sawdust carpet.